The CD44 antigen is a cell-surface glycoprotein involved in cell–cell interactions, cell adhesion and migration. In humans, the CD44 antigen is encoded by the CD44 gene on Chromosome 11. CD44 has been referred to as HCAM (homing cell adhesion molecule), Pgp-1 (phagocytic glycoprotein-1), Hermes antigen, lymphocyte homing receptor, ECM-III, and HUTCH-1. Glycoproteins are proteins which contain oligosaccharide chains (glycans) covalently attached to amino acid side-chains. The carbohydrate is attached to the protein in a cotranslational or posttranslational modification. This process is known as glycosylation. Secreted extracellular proteins are often glycosylated. A protein isoform, or "protein variant" is a member of a set of highly similar proteins that originate from a single gene or gene family and are the result of genetic differences. While many perform the same or similar biological roles, some isoforms have unique functions. A set of protein isoforms may be formed from alternative splicings, variable promotor usage, or other post-transcriptional modifications of a single gene; post-translational modifications are generally not considered. Through RNA splicing mechanisms, mRNA has the ability to select different protein-coding segments (exons) of a gene, or even different parts of exons from RNA to form different mRNA sequences. Each unique sequence produces a specific form of a protein. 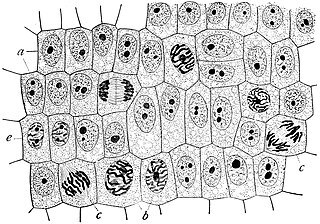 Epithelium is one of the four basic types of animal tissue, along with connective tissue, muscle tissue and nervous tissue. Epithelial tissues line the outer surfaces of organs and blood vessels throughout the body, as well as the inner surfaces of cavities in many internal organs. An example is the epidermis, the outermost layer of the skin. A lymphocyte is one of the subtypes of white blood cell in a vertebrate's immune system. Lymphocytes include natural killer cells, T cells, and B cells. They are the main type of cell found in lymph, which prompted the name "lymphocyte". Hyaluronic acid, also called hyaluronan, is an anionic, nonsulfated glycosaminoglycan distributed widely throughout connective, epithelial, and neural tissues. It is unique among glycosaminoglycans in that it is nonsulfated, forms in the plasma membrane instead of the Golgi apparatus, and can be very large: human synovial HA averages about 7 million Da per molecule, or about twenty thousand disaccharide monomers, while other sources mention 3–4 million Da. One of the chief components of the extracellular matrix, hyaluronan contributes significantly to cell proliferation and migration, and may also be involved in the progression of some malignant tumors. In coordination chemistry, a ligand is an ion or molecule that binds to a central metal atom to form a coordination complex. The bonding with the metal generally involves formal donation of one or more of the ligand's electron pairs. The nature of metal–ligand bonding can range from covalent to ionic. Furthermore, the metal–ligand bond order can range from one to three. Ligands are viewed as Lewis bases, although rare cases are known to involve Lewis acidic "ligands". 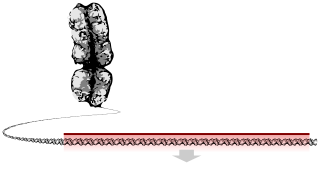 Osteopontin (OPN), also known as bone sialoprotein I, early T-lymphocyte activation (ETA-1), secreted phosphoprotein 1 (SPP1), 2ar and Rickettsia resistance (Ric), is a protein that in humans is encoded by the SPP1 gene. The murine ortholog is Spp1. Osteopontin is a SIBLING (glycoprotein) that was first identified in 1986 in osteoblasts. Alternative splicing, or differential splicing, is a regulated process during gene expression that results in a single gene coding for multiple proteins. In this process, particular exons of a gene may be included within or excluded from the final, processed messenger RNA (mRNA) produced from that gene. Consequently, the proteins translated from alternatively spliced mRNAs will contain differences in their amino acid sequence and, often, in their biological functions. Notably, alternative splicing allows the human genome to direct the synthesis of many more proteins than would be expected from its 20,000 protein-coding genes. Catenin beta-1, also known as β-catenin, is a protein that in humans is encoded by the CTNNB1 gene. Carcinoembryonic antigen (CEA) describes a set of highly related glycoproteins involved in cell adhesion. CEA is normally produced in gastrointestinal tissue during fetal development, but the production stops before birth. Consequently, CEA is usually present at very low levels in the blood of healthy adults. However, the serum levels are raised in some types of cancer, which means that it can be used as a tumor marker in clinical tests. Serum levels can also be elevated in heavy smokers. C-X-C chemokine receptor type 4 (CXCR-4) also known as fusin or CD184 is a protein that in humans is encoded by the CXCR4 gene. The selectins are a family of cell adhesion molecules. All selectins are single-chain transmembrane glycoproteins that share similar properties to C-type lectins due to a related amino terminus and calcium-dependent binding. Selectins bind to sugar moieties and so are considered to be a type of lectin, cell adhesion proteins that bind sugar polymers. E-selectin, also known as CD62 antigen-like family member E (CD62E), endothelial-leukocyte adhesion molecule 1 (ELAM-1), or leukocyte-endothelial cell adhesion molecule 2 (LECAM2), is a selectin cell adhesion molecule expressed only on endothelial cells activated by cytokines. Like other selectins, it plays an important part in inflammation. In humans, E-selectin is encoded by the SELE gene. Paxillin is a protein that in humans is encoded by the PXN gene. Paxillin is expressed at focal adhesions of non-striated cells and at costameres of striated muscle cells, and it functions to adhere cells to the extracellular matrix. Mutations in PXN as well as abnormal expression of paxillin protein has been implicated in the progression of various cancers. PTK2 protein tyrosine kinase 2 (PTK2), also known as focal adhesion kinase (FAK), is a protein that, in humans, is encoded by the PTK2 gene. PTK2 is a focal adhesion-associated protein kinase involved in cellular adhesion and spreading processes. It has been shown that when FAK was blocked, breast cancer cells became less metastatic due to decreased mobility. Podocalyxin, a sialoglycoprotein, is thought to be the major constituent of the glycocalyx of podocytes in the glomerulus. It is a member of the CD34 family of transmembrane sialomucins. It coats the secondary foot processes of the podocytes. It is negatively charged and thus functions to keep adjacent foot processes separated, thereby keeping the urinary filtration barrier open. This function is further supported by knockout studies in mice which reveal an essential role in podocyte morphogenesis and a role in the opening of vascular lumens and regulation of vascular permeability. Of note, this is the only cell surface sialomucin knockout known to display a lethal phenotype. Podocalyxin is also upregulated in a number of cancers and is frequently associated with poor prognosis. Sialylated, O-glycosylated glycoforms of podocalyxin expressed by colon carcinoma cells possess L-selectin and E-selectin binding activity, and may be pivotal to the metastatic spread of colon carcinoma cells. At the cellular level podocalyxin has also been shown to regulate the size and topology of apical cell domains and act as a potent inducer of microvillus formation. Atypical chemokine receptor 3 also known as C-X-C chemokine receptor type 7 (CXCR-7) and G-protein coupled receptor 159 (GPR159) is a protein that in humans is encoded by the ACKR3 gene. Carcinoembryonic antigen-related cell adhesion molecule 1 (CEACAM1) also known as CD66a, is a human glycoprotein, and a member of the carcinoembryonic antigen (CEA) gene family. LIGHT, also known as tumor necrosis factor superfamily member 14 (TNFSF14), is a secreted protein of the TNF superfamily. It is recognized by herpesvirus entry mediator (HVEM), as well as decoy receptor 3. Lysosomal-associated membrane protein 1 (LAMP-1) also known as lysosome-associated membrane glycoprotein 1 and CD107a, is a protein that in humans is encoded by the LAMP1 gene. The human LAMP1 gene is located on the long arm (q) of chromosome 13 at region 3, band 4 (13q34). CD166 antigen is a 100-105 kD typeI transmembrane glycoprotein that is a member of the immunoglobulin superfamily of proteins. In humans it is encoded by the ALCAM gene. It is also called CD166, MEMD, SC-1/DM-GRASP/BEN in the chicken, and KG-CAM in the rat. Hyaluronan-mediated motility receptor (HMMR), also known as RHAMM is a protein which in humans is encoded by the HMMR gene. RHAMM recently has been also designated CD168. Alpha-(1,3)-fucosyltransferase is an enzyme that in humans is encoded by the FUT7 gene. CD226, PTA1 or DNAM-1 is a protein that in humans is encoded by the CD226 gene which is located on chromosome 18q22.3. Vascular endothelial growth inhibitor (VEGI), also known as TNF-like ligand 1A (TL1A) and TNF superfamily member 15 (TNFSF15), is protein that in humans is encoded by the TNFSF15 gene. 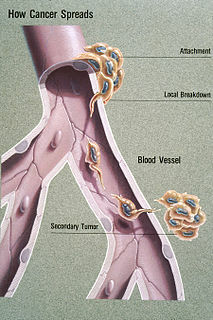 VEGI is an anti-angiogenic protein. It belongs to tumor necrosis factor (ligand) superfamily, where it is member 15. It is the sole known ligand for death receptor 3, and it can also be recognized by decoy receptor 3. 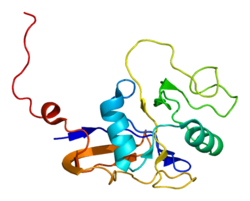 Disintegrin and metalloproteinase domain-containing protein 28 is an enzyme that in humans is encoded by the ADAM28 gene. ↑ Spring FA, Dalchau R, Daniels GL, Mallinson G, Judson PA, Parsons SF, Fabre JW, Anstee DJ (May 1988). "The Ina and Inb blood group antigens are located on a glycoprotein of 80,000 MW (the CDw44 glycoprotein) whose expression is influenced by the In(Lu) gene". Immunology. 64 (1): 37–43. PMC 1385183 . PMID 2454887. ↑ Goodison S, Urquidi V, Tarin D (Aug 1999). "CD44 cell adhesion molecules". Molecular Pathology. 52 (4): 189–96. doi:10.1136/mp.52.4.189. PMC 395698 . PMID 10694938. 1 2 Oxley SM, Sackstein R (Nov 1994). "Detection of an L-selectin ligand on a hematopoietic progenitor cell line". Blood. 84 (10): 3299–306. PMID 7524735. 1 2 3 Alves CS, Burdick MM, Thomas SN, Pawar P, Konstantopoulos K (Apr 2008). "The dual role of CD44 as a functional P-selectin ligand and fibrin receptor in colon carcinoma cell adhesion". American Journal of Physiology. Cell Physiology. 294 (4): C907–16. doi:10.1152/ajpcell.00463.2007. PMID 18234849. 1 2 Hanley WD, Burdick MM, Konstantopoulos K, Sackstein R (Jul 2005). "CD44 on LS174T colon carcinoma cells possesses E-selectin ligand activity". Cancer Research. 65 (13): 5812–7. doi:10.1158/0008-5472.CAN-04-4557. PMID 15994957. 1 2 Sackstein R, Merzaban JS, Cain DW, Dagia NM, Spencer JA, Lin CP, Wohlgemuth R (Feb 2008). "Ex vivo glycan engineering of CD44 programs human multipotent mesenchymal stromal cell trafficking to bone". Nature Medicine. 14 (2): 181–7. doi:10.1038/nm1703. PMID 18193058. ↑ Dimitroff CJ, Lee JY, Rafii S, Fuhlbrigge RC, Sackstein R (Jun 2001). "CD44 is a major E-selectin ligand on human hematopoietic progenitor cells". The Journal of Cell Biology. 153 (6): 1277–86. doi:10.1083/jcb.153.6.1277. PMC 2192031 . PMID 11402070. 1 2 Hanley WD, Napier SL, Burdick MM, Schnaar RL, Sackstein R, Konstantopoulos K (Feb 2006). "Variant isoforms of CD44 are P- and L-selectin ligands on colon carcinoma cells". FASEB Journal. 20 (2): 337–9. doi:10.1096/fj.05-4574fje. PMID 16352650. 1 2 Napier SL, Healy ZR, Schnaar RL, Konstantopoulos K (Feb 2007). "Selectin ligand expression regulates the initial vascular interactions of colon carcinoma cells: the roles of CD44v and alternative sialofucosylated selectin ligands". The Journal of Biological Chemistry. 282 (6): 3433–41. doi:10.1074/jbc.M607219200. PMID 17135256. 1 2 Thomas SN, Zhu F, Schnaar RL, Alves CS, Konstantopoulos K (Jun 2008). "Carcinoembryonic antigen and CD44 variant isoforms cooperate to mediate colon carcinoma cell adhesion to E- and L-selectin in shear flow". The Journal of Biological Chemistry. 283 (23): 15647–55. doi:10.1074/jbc.M800543200. PMC 2414264 . PMID 18375392. ↑ Sackstein R (Jul 2009). "Glycosyltransferase-programmed stereosubstitution (GPS) to create HCELL: engineering a roadmap for cell migration". Immunological Reviews. 230 (1): 51–74. doi:10.1111/j.1600-065X.2009.00792.x. PMC 4306344 . PMID 19594629. 1 2 Alves CS, Yakovlev S, Medved L, Konstantopoulos K (Jan 2009). "Biomolecular characterization of CD44-fibrin(ogen) binding: distinct molecular requirements mediate binding of standard and variant isoforms of CD44 to immobilized fibrin(ogen)". The Journal of Biological Chemistry. 284 (2): 1177–89. doi:10.1074/jbc.M805144200. PMC 2613610 . PMID 19004834. ↑ Griffith JS, Liu YG, Tekmal RR, Binkley PA, Holden AE, Schenken RS (Apr 2010). "Menstrual endometrial cells from women with endometriosis demonstrate increased adherence to peritoneal cells and increased expression of CD44 splice variants". Fertility and Sterility. 93 (6): 1745–9. doi:10.1016/j.fertnstert.2008.12.012. PMC 2864724 . PMID 19200980. ↑ Wang SJ, Wong G, de Heer AM, Xia W, Bourguignon LY (Aug 2009). "CD44 variant isoforms in head and neck squamous cell carcinoma progression". The Laryngoscope. 119 (8): 1518–30. doi:10.1002/lary.20506. PMC 2718060 . PMID 19507218. ↑ Quere R, Andradottir S, Brun A, Zubarev R, Karlsson G, Olsson K, Magnusson M, Cammenga J, Karlsson S (Mar 2010). "High levels of the adhesion molecule CD44 on leukemic cells generate acute myeloid leukemia relapse after withdrawal of the initial transforming event". Leukemia. 25 (3): 515–526. doi:10.1038/leu.2010.281. PMC 3072510 . PMID 21116281. ↑ Chen X, Khajeh JA, Ju JH, Gupta YK, Stanley CB, Do C, Heller WT, Aggarwal AK, Callaway DJ, Bu Z (Mar 2015). "Phosphatidylinositol 4,5-bisphosphate clusters the cell adhesion molecule CD44 and assembles a specific CD44-Ezrin heterocomplex, as revealed by small angle neutron scattering". The Journal of Biological Chemistry. 290 (10): 6639–52. doi:10.1074/jbc.M114.589523. PMC 4358296 . PMID 25572402. ↑ Jalkanen S, Jalkanen M (Feb 1992). "Lymphocyte CD44 binds the COOH-terminal heparin-binding domain of fibronectin". The Journal of Cell Biology. 116 (3): 817–25. doi:10.1083/jcb.116.3.817. PMC 2289325 . PMID 1730778. 1 2 Ilangumaran S, Briol A, Hoessli DC (May 1998). "CD44 selectively associates with active Src family protein tyrosine kinases Lck and Fyn in glycosphingolipid-rich plasma membrane domains of human peripheral blood lymphocytes". Blood. 91 (10): 3901–8. PMID 9573028. Sackstein R (Jul 2011). "The biology of CD44 and HCELL in hematopoiesis: the 'step 2-bypass pathway' and other emerging perspectives". Current Opinion in Hematology. 18 (4): 239–48. doi:10.1097/MOH.0b013e3283476140. PMC 3145154 . PMID 21546828. Sackstein R (Jul 2009). "Glycosyltransferase-programmed stereosubstitution (GPS) to create HCELL: engineering a roadmap for cell migration". Immunological Reviews. 230 (1): 51–74. doi:10.1111/j.1600-065X.2009.00792.x. PMC 4306344 . PMID 19594629. Human CD44 genome location and CD44 gene details page in the UCSC Genome Browser .